NASA's Messenger spacecraft manoeuvred into orbit around the planet Mercury, carrying seven science instruments that will be used for a survey of the planet's geochemistry, geophysics, geologic history and atmosphere. For the first time, a spacecraft is in orbit around the solar system's innermost planet. About 9pm EDT Thursday, NASA's Messenger spacecraft manoeuvred into orbit around Mercury. Carrying seven science instruments and built to withstand the blistering temperatures near the sun, Messenger is tasked with performing the first complete reconnaissance of the planet's geochemistry, geophysics, geologic history and atmosphere, according to NASA. Messenger is programmed to get images of different areas of the planet, including its northern pole, where some scientists surmise there might be ice. That would be a major discovery on a planet that is so close to the sun that its surface is 11 times brighter than Earth's. 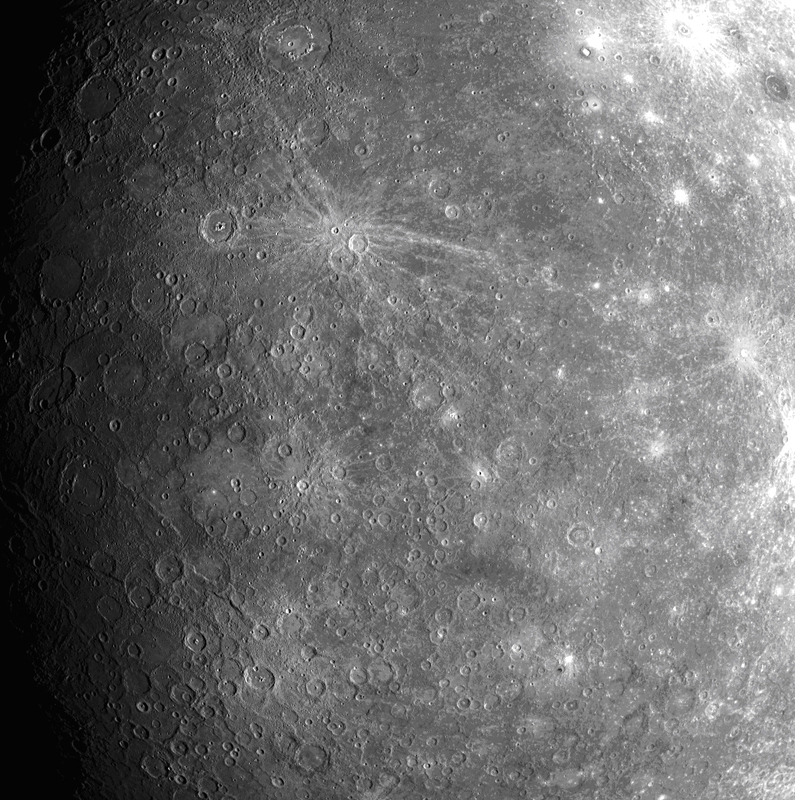 "From the outset of this mission, our goal has been to gather the first global observations of Mercury from orbit," said Messenger's principal investigator Sean Solomon and director of the Department of Terrestrial Magnetism at the Carnegie Institution of Washington. "At the time of our launch more than six and a half years ago, that goal seemed but a distant dream. Messenger is now poised to turn that dream into reality." Now that the spacecraft is in orbit, NASA engineers will begin checking Messenger's systems to make sure they are in working order. Starting on Wednesday, the spacecraft's instruments will be turned on and checked out and on 4 April the mission's primary science phase is set to begin. When Messenger entered Mercury's orbit, it was 28.67 million miles from the sun and 96.35 million miles from Earth. Messenger has been on a six-year mission to become the first spacecraft to orbit Mercury. NASA reported that it followed a path through the inner solar system, including one flyby of Earth, two of Venus, and three of Mercury. Messenger hasn't been scientifically idle during its journey to enter Mercury's orbit. During its second flyby of Mercury in the autumn of 2008, Messenger sent back more than 1,200 images of the planet's surface, along with topographical information and data about its atmosphere and magnetic fields. "The region of Mercury's surface that we viewed at close range for the first time this month is bigger than the land area of South America," Solomon said after the second flyby. "When combined with data from our first flyby and from Mariner 10, our latest coverage means that we have now seen about 95 percent of the planet." NASA's Messenger is the first spacecraft to return information about Mercury to Earth since the Mariner 10 mission more than 30 years ago. The space agency's Mariner 10 was the first spacecraft to reach Mercury and Venus. Mariner 10 flew by Mercury three times, returning images and data from the planet. The scientists behind Messenger hope to take this latest mission several steps further. Data from Messenger will be collected by Deep Space Network antennas and transferred to the Mission Operations Center at the Johns Hopkins University Applied Physics Laboratory in Laurel, Maryland, where it will be analysed. NASA scientists and engineers have spent about 20 years developing new materials and technologies for Messenger. Its structure was built out of a graphite epoxy material that was designed to be strong enough to withstand the launch yet light enough to lower the probe's overall mass and save on energy usage. Two large solar panels and a nickel-hydrogen battery power the spacecraft. The Messenger uses two computer chips - a 25 MHz main processor and a 10 MHz backup processor. The spacecraft, according to documents on NASA's website, includes a gamma ray and neutron spectrometer that is designed to map different elements and offer clues about the existence of ice at the planet's poles. A magnetometer attached to a nearly 12-foot boom will scan the planet for areas of magnetized rocks. Dual-imaging cameras, one with a wide-angle imager and one with a narrow-angle imager, will map the surface and give scientists a topographical view.